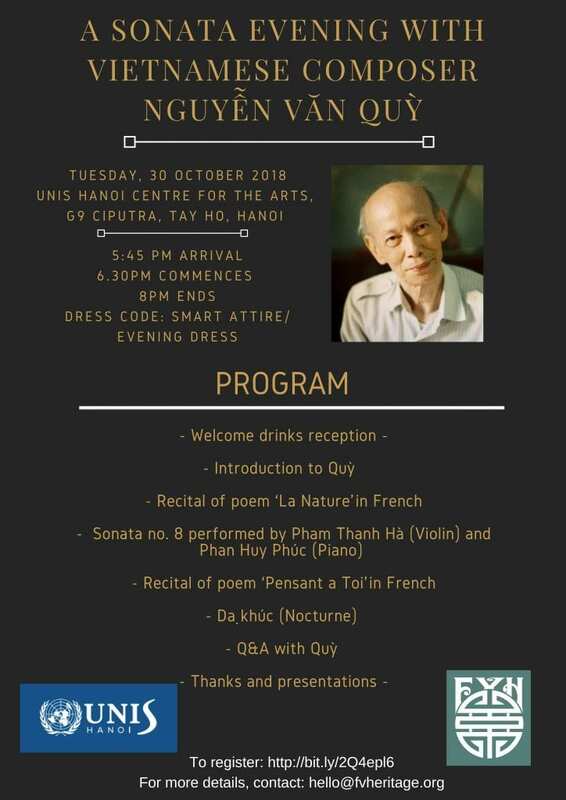 UNIS Hanoi is partnering with Friends of Vietnam Heritage to host a special cultural musical event: A Sonata Evening with Vietnamese Composer Nguyễn Văn Quỳ on the evening of Tuesday, October 30. The event will begin with a reception in the Centre for the Arts foyer from 17.45 and the performance will start at 18.30 in the UNIS Hanoi Theatre. The evening will be a celebration and performance of Master Quy’s work as a classical music composer and poet. Master Quy, now 93 years old, has been nicknamed the “Beethoven” of Vietnam for his prolific composition. More details about the event can be found on FVH website here. The link for registration for the event is here. This event is FREE for UNIS Hanoi students, and discounted for UNIS Hanoi staff and parents (100,000 VND). For Hanoi community (non-UNIS) the cost is 200,000 VND. For your convenience, payment by UNIS Hanoi community members may be made after registering online at the reception desk in the Admin building (B7), 8.00-12:30 and 13.30-17.00, Monday-Friday beginning Monday, 15 October. Registration is open now and you may complete the payment later after the October break. This is a non-profit event and proceeds will support an honorarium for musicians and Master Quy. Parents please note that alcohol will be served to adults during the reception preceding the event 17.45 – 18.30.